I took the last week off from the internet, all of it, every social media and email. It’s just what I needed to relax, reflect, and reboot. R & R times a thousand. While we were in Idaho for a funeral and celebration of life, it was the perfect time for this break, mini vacation, and time of reflection. It was quality time spent with Brian and family, hanging out talking, cooking, eating, reading, and enjoying each other. I’ve always been a proponent of phones down time and no tv, it is a necessary part of my life from time to time. Everyone enjoyed it as much as I did. I’m not sure everyone else did the no internet and social media time, but when I did, it was noticeable. I am on my phone or social media for work all of the time, so when I am not, I have a lot of time on my hands, literally. Get parchment lined baking sheet and egg wash with brush ready to go. 1. Place flour, sugar, baking powder, salt, baking soda, and lemon zest in a large bowl, whisk to combine. Add ice cold butter cubes, rub butter into flour forming small pea sized chunks using your fingers. Add peaches and berries, mix using a spatula. Add buttermilk, and lemon juice, using a spatula, combine gently. Make sure to keep everything cold, if your hands warm up, run under cold water and place bowl in fridge for a few minutes. 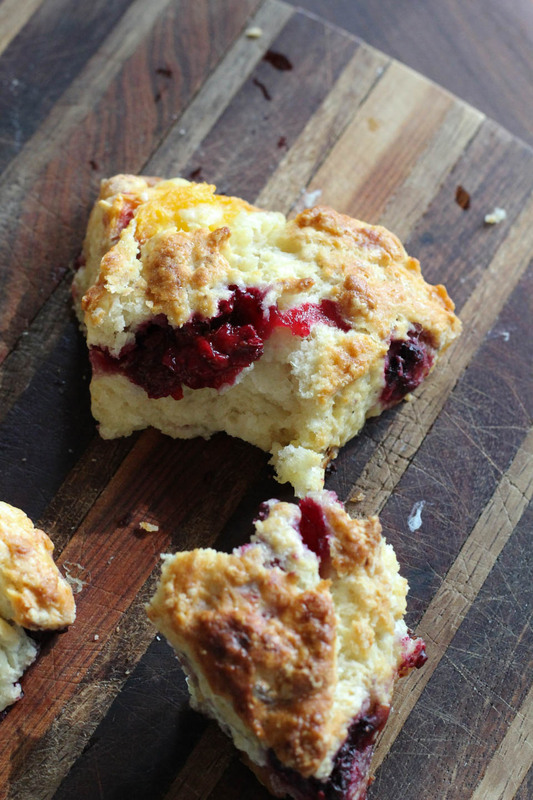 The key to perfect scones is keeping everything cold. 2. Turn dough out onto a lightly floured counter. Bring dough together gently, forming a uniform disk, use a bench scraper to cut into two even pieces. Form each piece into a circle 1 1/2 inch thick. Cut each circle into 8 even triangles using a knife or bench scraper. For better results, place unbaked scones in freezer for a minimum for 30 minutes. 3. Remove from freezer, and place on a parchment lined baking sheet. Brush with egg wash and bake for 25 minutes. Remove from oven, and place on cooling rack. Best enjoyed freshly baked. Place leftovers in airtight container, and leave at room temperature for up to three days. For longer storage, place in ziplock bag in freezer for up to 1 month. Remove and defrost on counter the day of. did you use fresh or frozen fruit? Hi Martha, you can use 1 1/2-2 cups blackberries, fresh or frozen. I hope you like them! These look wonderful! I love baking with buttermilk, too. Can’t want to try these for a special breakfast. Me too, I love the light tanginess! I wish I had one of these for breakfast this morning instead of oatmeal! Looks sooooooo tasty. 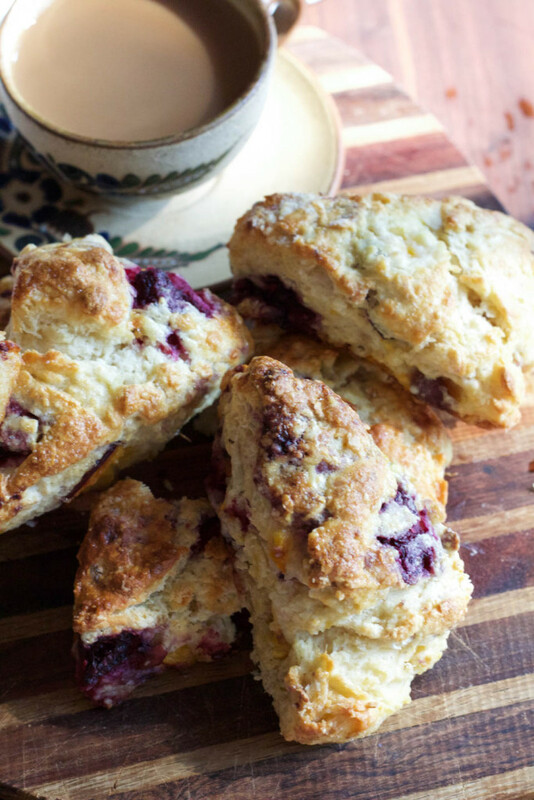 Peaches and berries make me happy and so do scones. This is the perfect brunch recipe. They are so good together!Thank you. these are beautiful looking scones! I would love a couple for breakfast or tea! 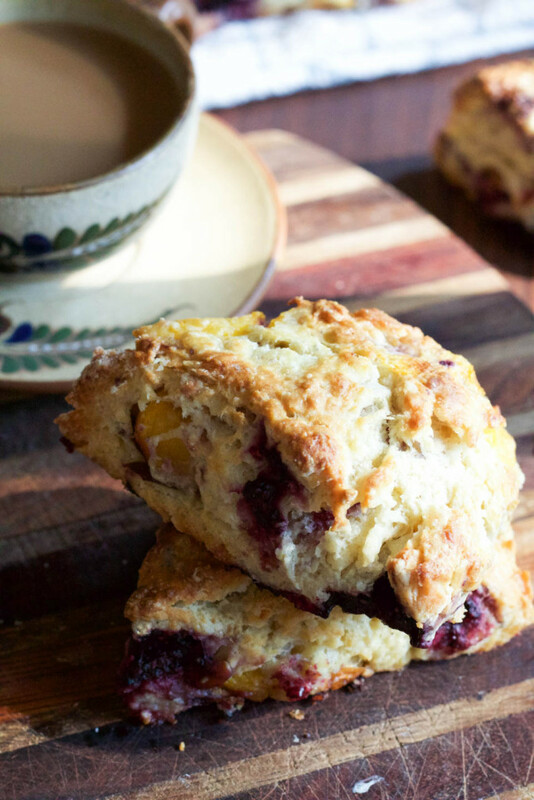 You just can’t beat the Summer freshness of peaches and blackberries – such a great combination in a scone! Hooray for scones! 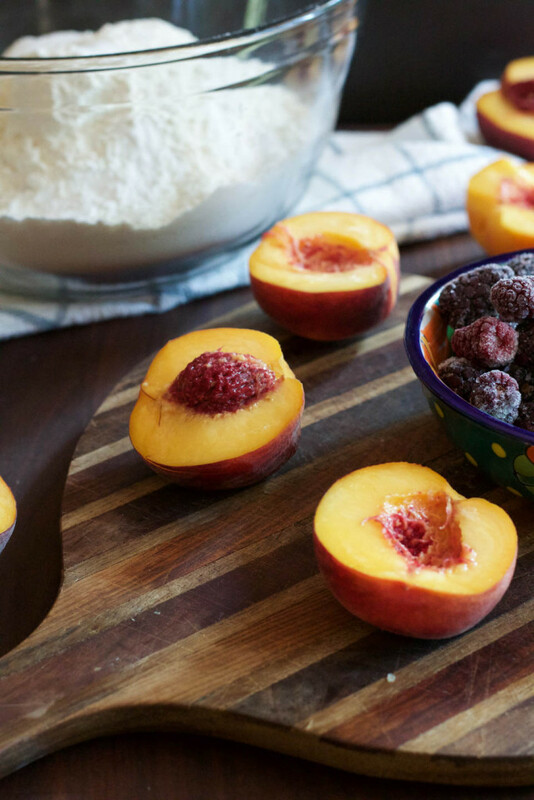 Peach and blackberry is such a perfect late-summer combination. YAY!!! Enjoy your last days of Summer lady! Ohh, Ahhh. I am a scone addict and these fruit ones look wonderful!